Reflex arc. Illustration of a human reflex arc. Sensory nerve endings (lower right) detect a stimulus, such as pain. 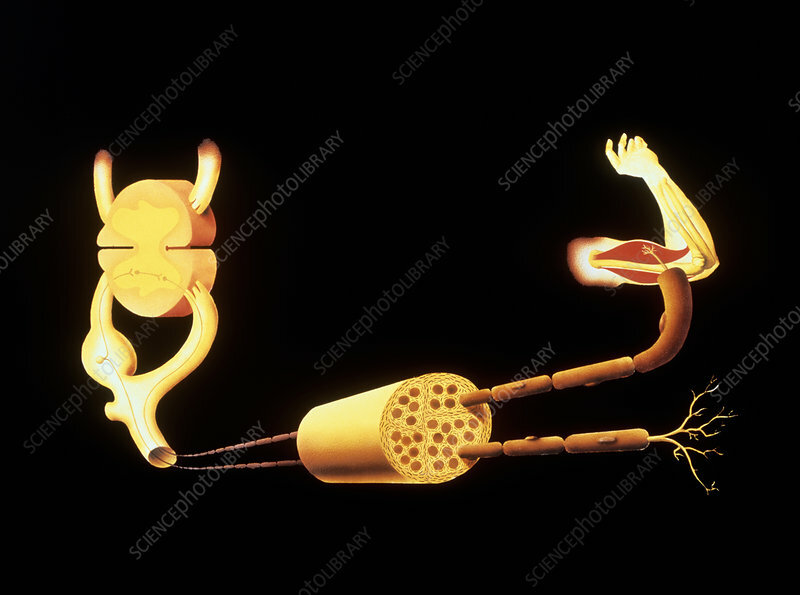 The nervous signal passes along the sensory nerve cell fibre to the spinal cord (left), where synapses transmit the signal to a motor nerve cell via an interneuron. The sensory nerve cell body is shown at centre left in a ganglion just outside the spinal cord. The motor nerve cell transmits the signal to an appropriate effector organ, in this case a muscle in the arm. Reflexes like this happen involuntarily, before the brain has had time to receive or interpret the stimulus.